Every trainer I know can recount horror stories of veterinarians giving their clients bad training and behavior advice, and handling dogs inappropriately. 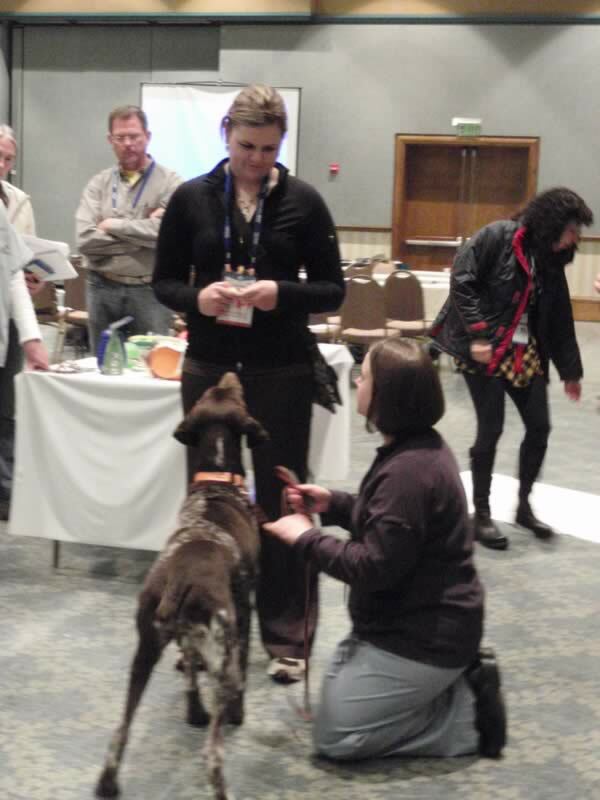 The good news is that a growing number of veterinarians are taking interest in learning appropriate information about dog behavior and training. Yes, there is a bright light on the veterinary horizon. 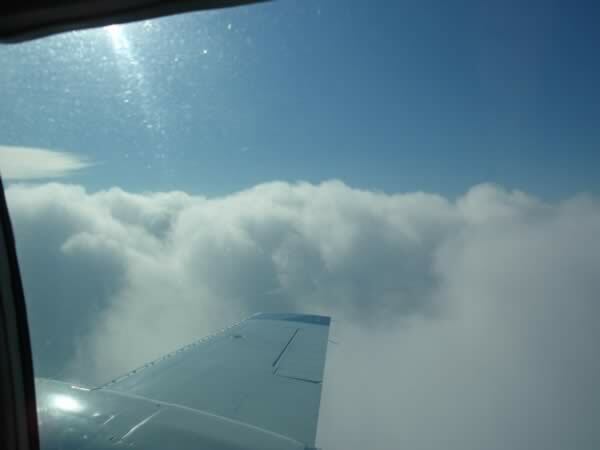 Flying above the clouds on the way to Orlando for the NAVC conference. There *is* a bright light on the horizon! 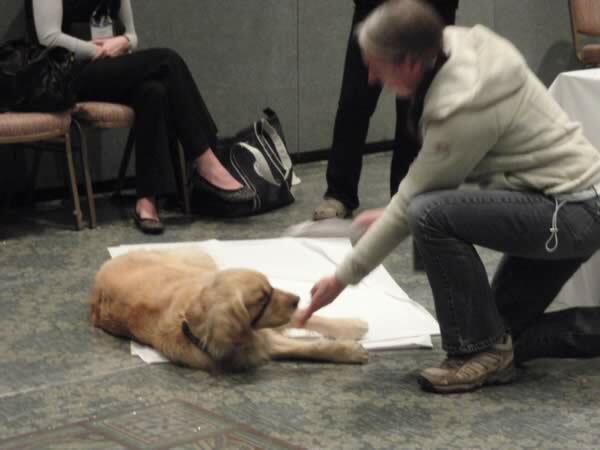 I saw this with my own happy eyes at the recent NAVC (National Association of Veterinarians Conference) in Orlando, Florida, where I had been invited to present at and assist in an all-day behavior lab with the renowned veterinary behaviorist, Dr. Karen Overall. One of the two NAVC vendor exhibit halls. Huge. 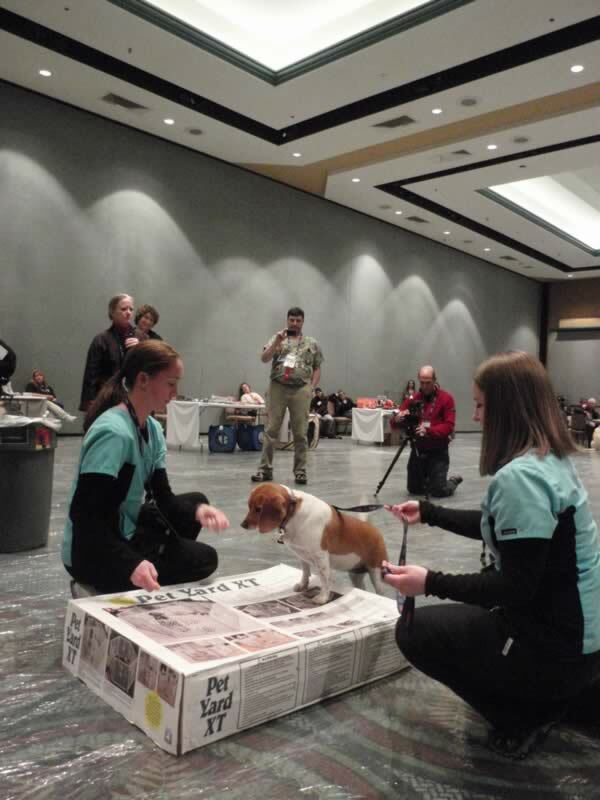 This conference draws more than 14,000 vets, vet techs and others interested in veterinary medicine, shelter medicine and behavior, and includes two packed exhibit halls. It’s huge! In addition to the behavior labs and lectures, there are week-long tracks on every aspect of veterinary medicine imaginable. 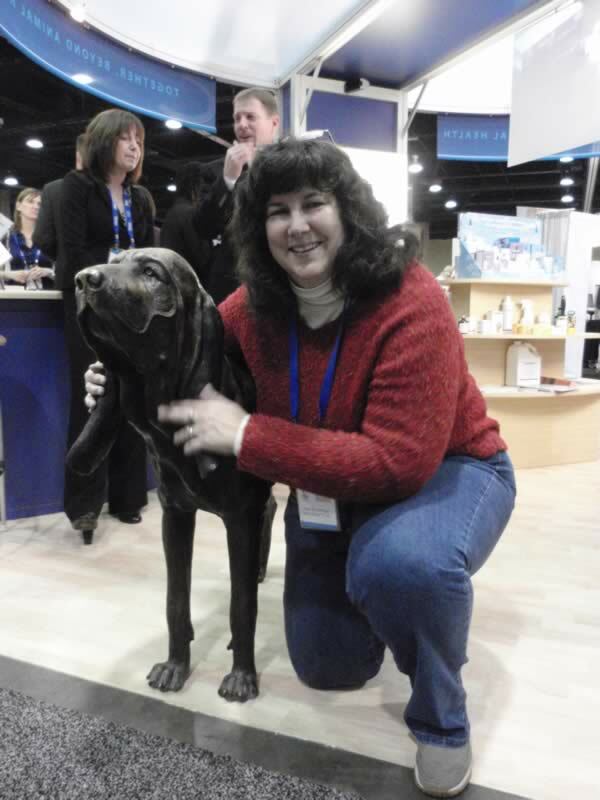 Stoic Bloodhond sculpture guarding one of the booths tolerates a hug from fellow trainer and friend, Anne Marie Easton, from Memphis. Thanks in large part to the efforts of Dr. 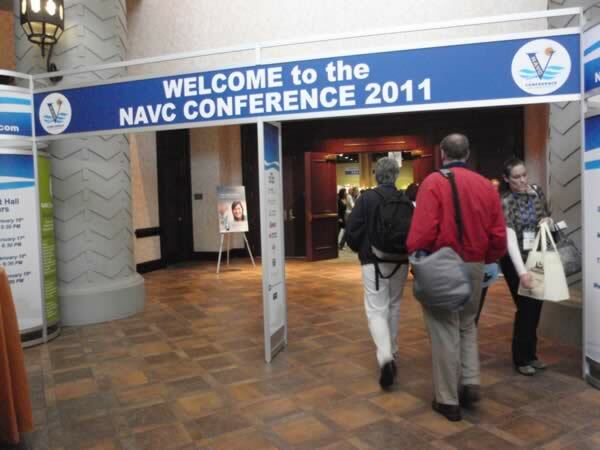 Overall, this year for the very first time ever, the NAVC offered an entire week-long behavior track for veterinarians. Last year they offered a partial track, at which I also presented, and the subject was so well-received they made it a full track this year. Also in large part thanks to Dr. 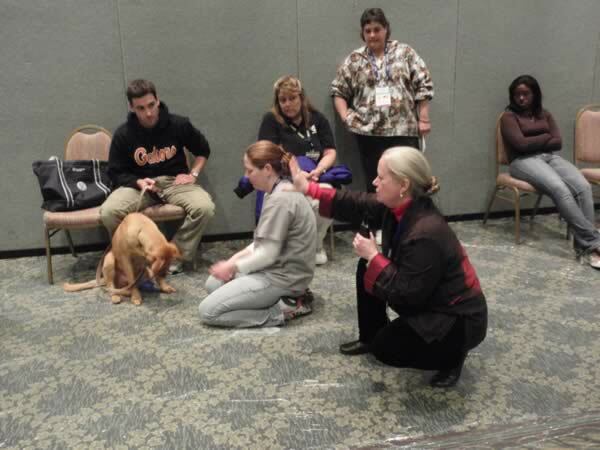 Overall, the speakers for this track, primarily veterinary behaviorists, were all on board with the positive reinforcement approach to handling, managing, training and modifying behaviors. We worked with dogs in the lab, but emphasized throughout that the information presented was applicable to all species. 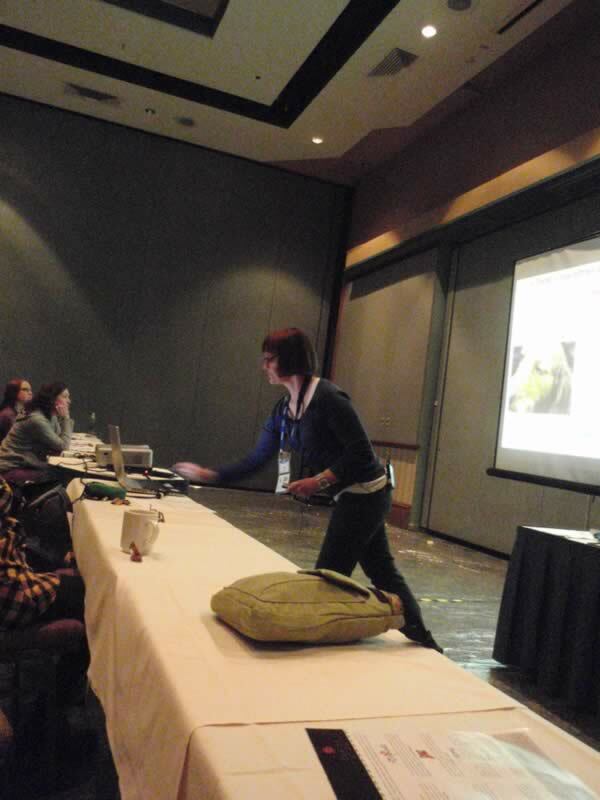 The behavior lab was a capacity sellout, and many of the lectures I attended filled the huge lecture hall. 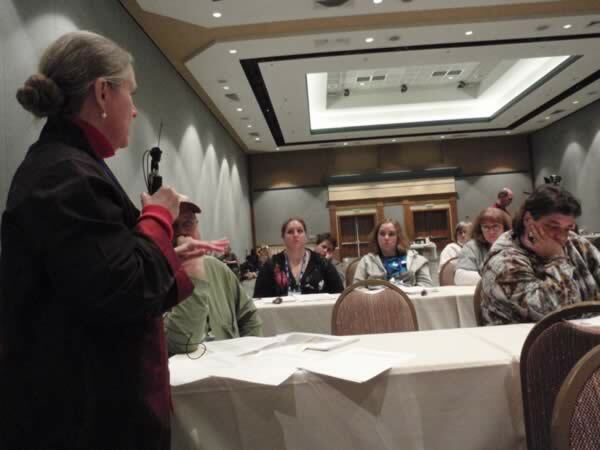 The renowned Dr. Karen Overall, tireless advocate for humane training and behavior modification, addresses the lab. Dr. Tiny De Keuster, all the way from Belgium, speaks to the lab. 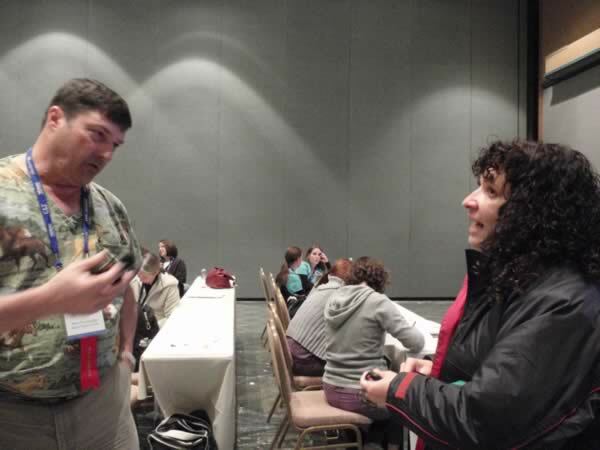 Dr. Soraya Juarbe-Diaz (right) a strong positive presence at the lab, and in the veterinary behavior world. 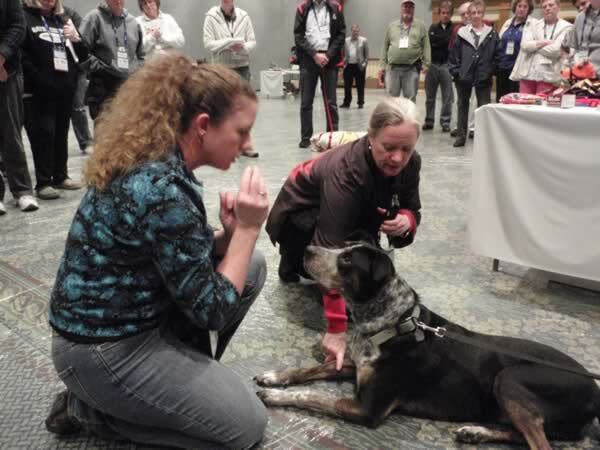 Teaching dogs to breathe, to reduce anxiety. 3.45-4.30P Demonstration of tasks and last questions. Dr. Overall offers suggestions for helping this dog get comfortable with lying on his side for an ultra-sound. Teaching a dog to offer his front leg for a blood draw. 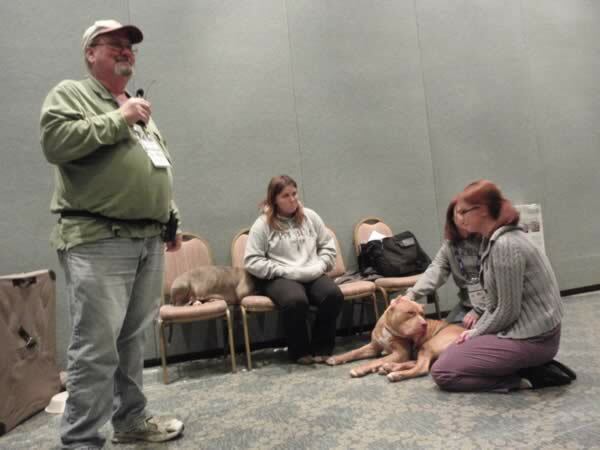 Ken McCort’s group worked on a hind leg blood draw with this very cooperative bully dog. This Golden is ready for her ultrasound! The day ended with a strong take-home message to attending vets and techs that it’s not necessary to rush a dog, or use forcible restraint to accomplish their handling, exam and treatment goals. The trauma inflicted in an effort to get the job done quickly causes long-term behavior challenges, sometimes very serious ones, that are better avoided, for the well-being of dogs and their owners, for the safety of clinic staff and for client retention. If it there is urgency to the procedure, there are still ways of minimizing the trauma – sedation is often an appropriate option. If your animal care professionals haven’t yet bought into the science-based positive reinforcement approach to animal care and training, and aren’t willing to listen and learn, look elsewhere. There is no excuse anymore for abusive animal handling. If you’re looking for a trainer/behavior consultant, check out the trainer referral lists on my own Peaceable Paws website, as well as the list on the Truly Dog Friendly site, also Karen Pryor Certified Trainers, the Certification Council for Professional Dog Trainers, and the International Association of Animal Behavior Consultants. Even if you find a trainer n one of these lists, use your own judgment to determine if they are the right person to work with your dog. Always remember that you are your dog’s protector. He depends on you to look out for his well being and keep him safe. You always have the right to say no if someone wants to do something to your dog that you know isn’t right. Not just the right, but the duty and obligation. 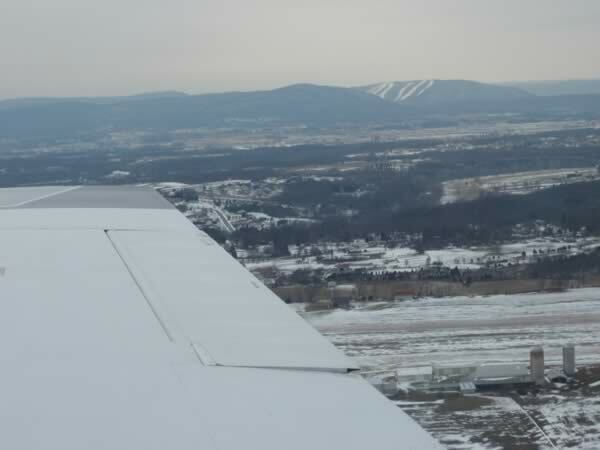 I always know I’m almost home when I see the ski runs at Whitetail Resort in the distance. I feel very fortunate that I’ve gotten such gentle and reasonable handling from my vets. On the other hand, I’ve also worked very hard to make sure my dogs are easy to handle, even under stress. And I recognize that vets need to be safe and able to do their jobs effectively. I think this program is great. The best things for animals almost always seem to help people as well. I think this is a great example. Kitti- Have you (and your staff) read Dr. Yin’s “Low Stress Handling and Restraint?”. There are muzzles and restraint used- but she shows and demonstrates on the DVD the best way to accomplish this with minimal stress to the animal- in a veterinary setting. You have to do what you have to do, but at the same time that “you have to do” can cause a long-term, lasting behavioral problem in an animal. I know that sometimes there aren’t options- but this should be the exception rather than the rule. This is terrific! Wish I could have been there. It is so refreshing and heartening to hear of such broad interest among vets in learning about behavior from two of my very favorite experts. There are 2 gifts I try to give all my dogs. One is a recall so they have the freedom to run and explore off leash. The second is the ability to be in a vet clinic and not be so stressed and scared that we are miserable being there. I can’t say they all are happy to be there but even my most people fearful dog can get off the exam table, have a shake off and then sit and look at me for his cheese. It took time and some effort but the understanding and willingness of my vet to help me made all the difference. She even started keeping tongue depressors and a jar of peanut butter on hand. I actually got a bit teary-eyed reading this! I have been so grateful to have vets for my own animals who are gentle and have great handling skills. Many of my clients have, as well. For the owners, the animals, and the veterinarians, I see this as one of those serendipitous situations where the most ethical thing to do can also be very efficient and practical.